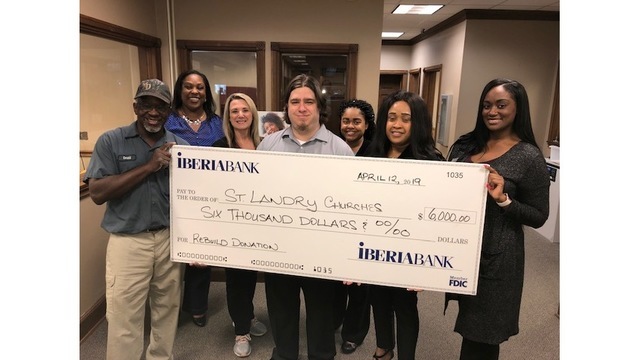 IBERIABANK is donating $6,000 donation to support the rebuilding of the three historic St. Landry Parish churches, recently destroyed by fires. The donation is in conjunction with Giles Automotive’s Giles Gives Back to St. Landry Churches. Contributions can be made to the donation account at any IBERIABANK branch location. Giles Automotive has committed to matching the first $50,000 in donations made during the 30-day fundraising effort were funds will be distributed evenly between St. Mary’s Baptist Church, Greater Union Baptist Church, and Mount Pleasant Baptist Church.